What’s up is that there are different ways to bend a tube, and each way makes sense for some applications, but not for others. All tube fabricators have their specialties, which means we have machines and dies that do some kinds of work easily and can’t do other work without a huge investment (huge). At Detroit Tube Products, we focus on mandrel bending of relatively thin-walled metal, on a tight radius. It’s a process that puts a support inside the tube (the mandrel or arbor) while the machine pulls the tube around a die that’s shaped like the bend we want to create. Without that mandrel, the tube will tend to collapse and lose its original cross-section (round or rectangular, for example). A heavier-walled tube or pipe doesn’t need so much support and can often be “empty-bent” without a mandrel and stay reasonably round in cross-section. Even a mandrel-bent tube will not be perfectly round throughout the bend area, depending on how severe the bend is. There are different styles of a mandrel, some of them are solid rods, others with linked balls attached to the end. The balls enable more difficult bends. Ask our friend Google for “bend tooling” and you’ll have a feast of images. There are plenty of applications where you don’t need that shape to be maintained: a muffler shop will bend a tube as a replacement with wrinkled, caved-in bends, and it’s perfectly useful for getting those exhaust gases where they need to go. Who cares how it looks? It’s under the car! 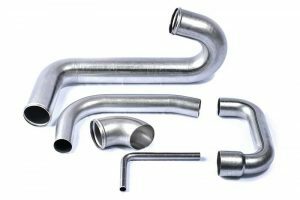 Now, stainless steel tube bending for classic cars might be a different story. Furniture often has a tubular frame. Look at a stacking tubular chair, a hand-cart, or a school desk, and you’ll see the bends “dented in.” They’re often bent in a press operation; they look uniform, stack and assemble well, and are relatively inexpensive to produce.